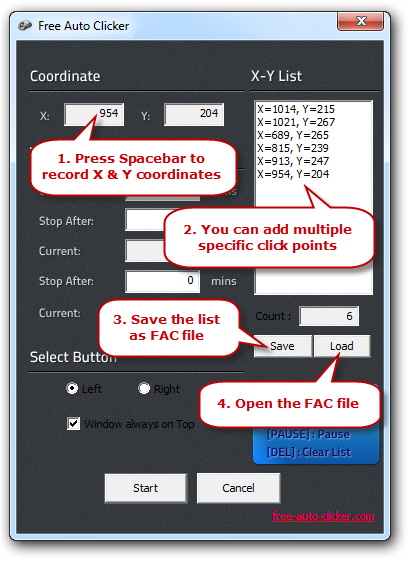 For those who want to record one or multiple clicks, Free Auto Clicker provides the coordinate calculator to record multiple specific points in order. The list can be saved as an FAC file for convenient perform of the same actions next time. Move the mouse cursor to the place where you would like the program to click, and press the Spacebar so that the X & Y coordinates will be displayed inX & Y boxes. You can add multiple specific click points to X-Y List. The counter will count the points you recorded. If needed, press Delete on the keyboard to clear the list. By “Save” you can output the list as an FAC file. Next time you need the same actions performed, just click “Load” to open the FAC file.